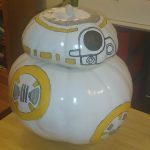 The post SWNN Contest: Enter Your Best Star Wars Themed Pumpkin Creation to Win One of Two Star Wars Books! appeared first on Star Wars News Net. Star Wars Rebels: The Siege Of Lothal Teaser Unveiled! Star Wars: The Force Awakens Crosses $100 Million Dollars In IMAX!